Classic Car Auctions held its biggest sale of the year at the NEC restoration show in March. In total, 130 out of 161 cars were sold – that’s £2.1m worth of metal at the two-day NEC sale on 25-25 March. 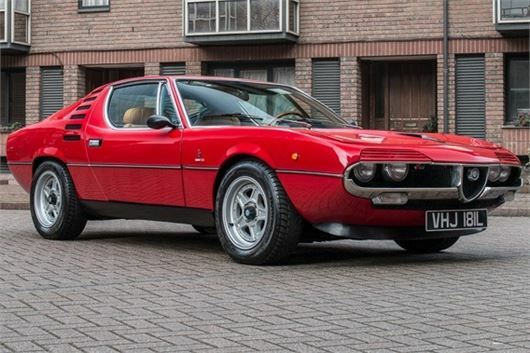 Top price went to a restored 1972 Alfa Montreal that sold for £59,400. It was followed by another Montreal project car from the same year, which sold for £28,600 to an internet bid from New Zealand. Meanwhile, a 1948 Jaguar 3.5-litre Mk IV Drophead Coupé sold for £40,700 - more than twice its upper estimate. Other strong sellers included a 1964 Morris Mini Cooper 970 ‘S’ (£40,700), a 1975 Vauxhall Firenza 2.3 ‘Droopsnoot’ (£18,150), and a 1975 Jensen Interceptor SIII 7.2-litre (£56,100). Fords were as in demand as ever with a 1987 Ford Capri 280 ‘Brooklands’ Turbo Technics fetching £26,400. Other modern classics going under the hammer included a 1973 Datsun 240Z (£24,750) and a 1990 Porsche 911 (964) Carrera Targa 4 (£36,850). Celebrity cars also sold well. A 1977 Mercedes-Benz 450 SEL once owned by music legend Sir Barry Gibb sold for £17,600, while a 1995 BMW E38 750iL previously owned by rocker Francis Rossi OBE fetched £7150 and a 1985 Bentley Turbo R, once the property of global superstar Sir Elton John CBE, sold for £10,120. To see all the results, visit classicarauctions.co.uk.